Imagine what life was like in Canada 100 years ago: World War I was being fought by Canadian soldiers in Europe, inventions like the telephone were becoming more common household items, and the television was in the process of being invented. Now, imagine what life was like in Canada 100 million years ago: the Western Interior Seaway covered much of Alberta, dinosaurs walked the Earth, and recent research suggests that Vancouver Island was at the latitude of southern California or northern Mexico, near present-day Baja. If this research is correct, Vancouver Island could not only have had a completely different climate 100 million years ago, but it would have moved around 3,000 kilometres north since then. However, scientists from several Canadian and America universities have spent decades debating how far “Baja B.C.” moved to reach its current location. 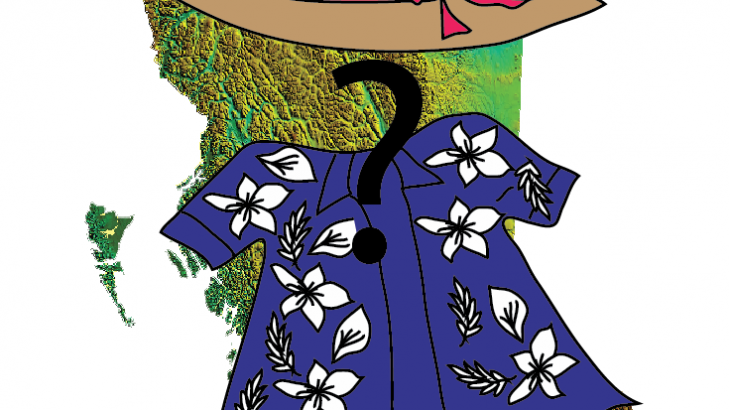 Most obviously, there are implications for understanding the geologic history not only of Vancouver Island, but also parts of B.C., Alaska, Yukon, and Washington State. Economically, this history impacts the geologic evolution of some of the most gold- and copper-rich areas of B.C. Academically, studies have shown that the geology of Vancouver Island and the surrounding Gulf Islands is impacted by the location of Vancouver Island and associated ocean basins 100 million years ago. Let’s start with the fossil evidence. 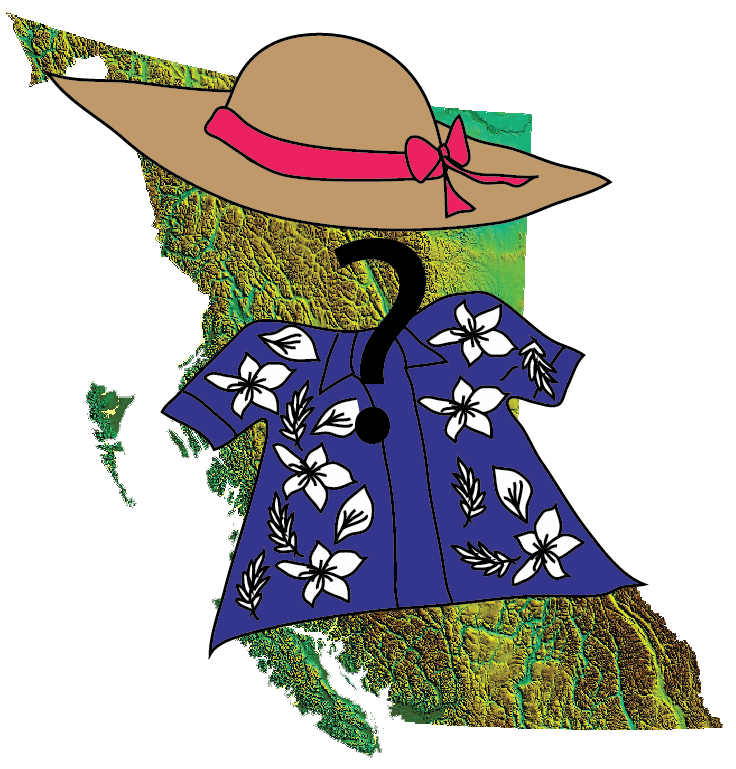 Paleontologists have hypothesized that, if Vancouver Island was at the sub-tropical to tropical latitude of California or Mexico 100 million years ago, sedimentary rocks of the Nanaimo Group on Vancouver Island would contain warm water fossils of marine animals that lived in warm parts of the paleo-Pacific ocean. A representative of this type of fossil is a group of cup-shaped clams called rudists (see Figure 2), which existed for a short period of time about 100 million years ago in the waters off Mexico and California. If the sedimentary strata that make up part of the bedrock of Vancouver Island were deposited at this latitude, they would likely contain this type of fossil. The second line of scientific evidence comes from studying the magnetic properties of the bedrock of Vancouver Island. Earth’s magnetic field is a type of force field created by electric currents generated by the movement of metals within Earth’s core. This is what makes compasses point north. When rocks form on Earth’s surface, magnetic metals (for example, iron) within them are frozen in place by Earth’s magnetic field. 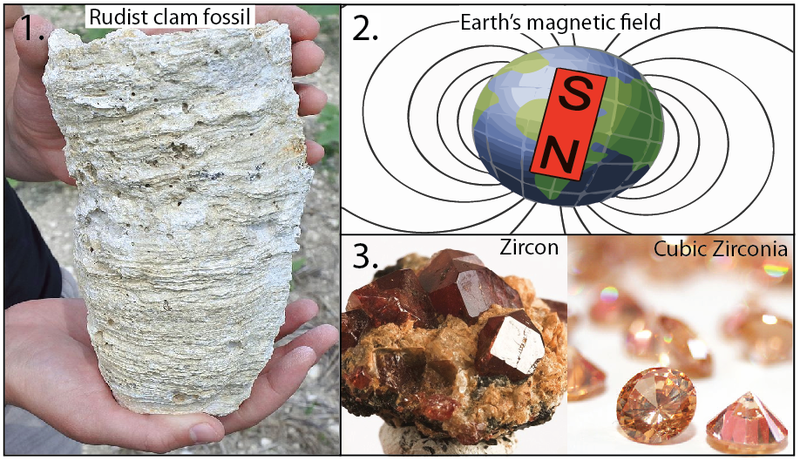 As the magnetic field is different at different places on Earth’s surface and has been different at different times during Earth’s history, examining the magnetic properties of rocks can help geologists determine where they formed and their approximate age. 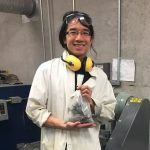 A third useful line of evidence comes from studying the chemistry of a common mineral found in sedimentary rocks of Vancouver Island: zircon. This is similar to cubic zirconia, a crystal created in laboratories to look like a diamond. Zircon contains a radioactive element, uranium (U), which decays (changes) to a non-radioactive element, lead (Pb). For this type of analysis, uranium has two useful isotopes (238U and 235U) which have half-lives of 4.47 billion years and 710 million years, respectively. This means that for a sample of the second isotope of uranium (235U), after 710 million years, half of the sample will have decayed to 207Pb. By measuring how much 206Pb and 207Pb and how much U238and U235a zircon crystal contains, scientists can use the half-lives of uranium to determine how old a rock is. This is how we know the age of some of the oldest rocks on Earth. Scientists use these data to try and match Vancouver Island geology with the unique age of zircon in the rocks of Mexico and California. Finally, scientists studying the Baja B.C. debate the question of where the fault lines are that allowed Vancouver Island to migrate so far north, as this is potentially the most direct line of evidence for or against the Baja B.C. hypothesis. A study published in 2006 by scientists from the University of Georgia and Northern Arizona University connects known fault lines along the Pacific coast of the U.S.A. and B.C. and uses them to interpret the magnitude of northward displacement of Vancouver Island. 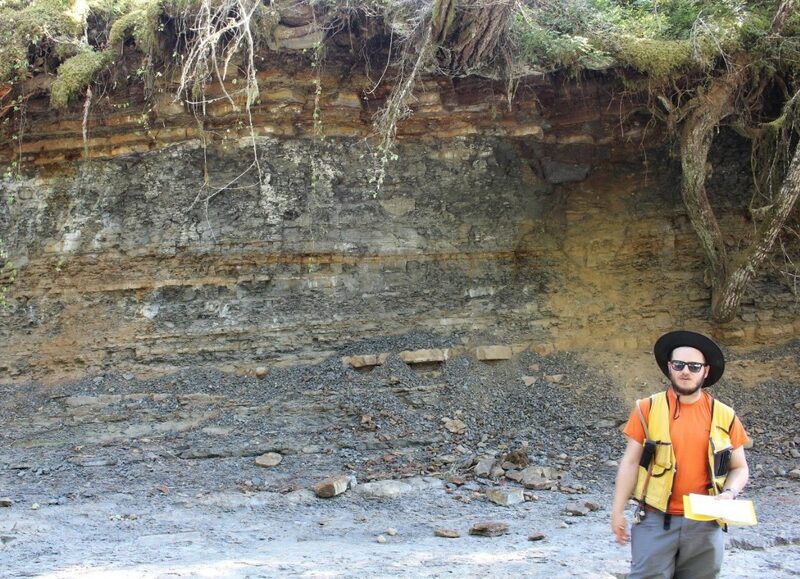 In the Earth Sciences department at Simon Fraser University, in Burnaby, B.C., two master’s students, Chuqiao Huang and Bryan Kent, are studying the sedimentary rocks of the Nanaimo Group on Vancouver Island to determine how and when they formed. 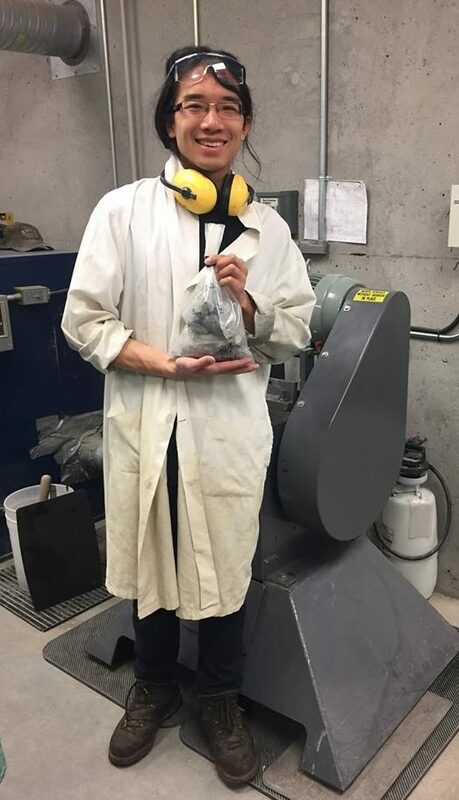 As students in the Arise Group, their research involves mapping and describing the sedimentary rocks of the Nanaimo Group on Vancouver Island and analyzing zircon found in these rocks. Their work will inform future studies on the Baja B.C. debate, as their geochemical, sedimentologic, stratigraphic, and palaeoenvironmental investigation of the Nanaimo Group will enhance our scientific understanding of some of the rocks used as evidence in the Baja B.C. debate. 3,000 km or less than 1,000 km? Like many scientific theories, the Baja B.C. hypothesis is subject to a lot of debate. Recent studies from the University of Calgary using zircon suggest that Vancouver Island migrated 3,000 kilometres north from the latitude of Mexico or California. However, this represents a maximum displacement estimate. It adds further fuel to the Baja B.C. debate, as studies that use mapping of geologic faults suggest closer to 1,000 kilometres of northward movement for Vancouver Island. Further, no fossil rudist clams have been found in the rocks of Vancouver Island, and magnetic data from these rocks are inconclusive. We don’t know. And that’s okay. One of the most interesting aspects of science is that theories are dynamic concepts that are still being changed and contributed to by the scientists who study them. Although we currently don’t have a final answer to the Baja B.C. debate, we hopefully will know for sure one day. 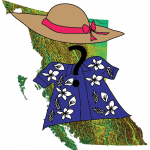 It may even be a scientist from B.C.’s Simon Fraser University that gives us the final clue. Environmental and Earth Sciences, Guest Authors, New Science Communicators Arise Group, Baja B.C. hypothesis, geochemistry, Miranda Walters, Nanaimo Group, new science communicators, Northern Arizona University, palaeoenvironmemt, Pitch and Polish, plate tectonics, radioactive decay, sedimentology, Simon Fraser University, stratigraphy, University of Calgary, University of Georgia, Vancouver Island, zircon. permalink.